IRVINE, Calif. – The first big upset of the 2016 MCLA National Championships powered by Under Armour was an epic Division II tug of war won by No. 7 Reinhardt, 9-8 over No. 2 Dayton sending the defending national champs home to Ohio. Saving you a trip to Google Maps, Reinhardt is a small NAIA school that makes up most of the rural town of Waleska, Ga.,, about 50 miles north of Atlanta. If the Eagles didn’t register on anyone else’s GPS, Dayton was already plenty familiar. It showed from the get-go. Three unanswered goals in the first quarter put the Eagles aloft early before the Flyers shot ‘em down. Dayton responded with four straight goals to take a 4-3 lead at half. The Eagles scored early out of the break to tie the game, igniting the back and forth second half featuring three lead changes. Tied at five late in the third, attackman Dennis Bell scored his second marker of the game as RU took back the lead. The Eagles extended it when freshman Bennett Jarrett blasted the net to finish a well-executed man advantage. The Flyers responded in the 4th quarter, scoring the next two goals, including lanky freshman defenseman Peter Lundy racing the length of the field on a breakaway to score the equalizer on an overhand power shot with the long stick. The Eagles rose to the challenge and when Jarrett scored his second in a row, Reinhardt never looked back. Junior Jeff Mathis bounced one in two minutes later to reclaim the two goal led and RU held on for the 9-8 victory. Reinhardt advances to play the winner of the Concordia – Grand Valley State quarterfinal. Dayton finishes the season with a 12-3 record. In a game that featured unbelievable goalie play despite the high score, No. 1 St. Thomas (16-0) out-slugged No. 8 Lourdes (13-4), 20-14, in the quarterfinal round. The Tommies advance to play the winner of the North Dakota State-Kennesaw State game in the semifinals. St. Thomas junior goalie Austin Dover tied the single-game MCLA Division II tournament record with 26 saves – tying a record set just yesterday by Southern Oregon goalie Connor Kelley – while Lourdes backstop Connor Mishler had 22 saves in the losing cause. 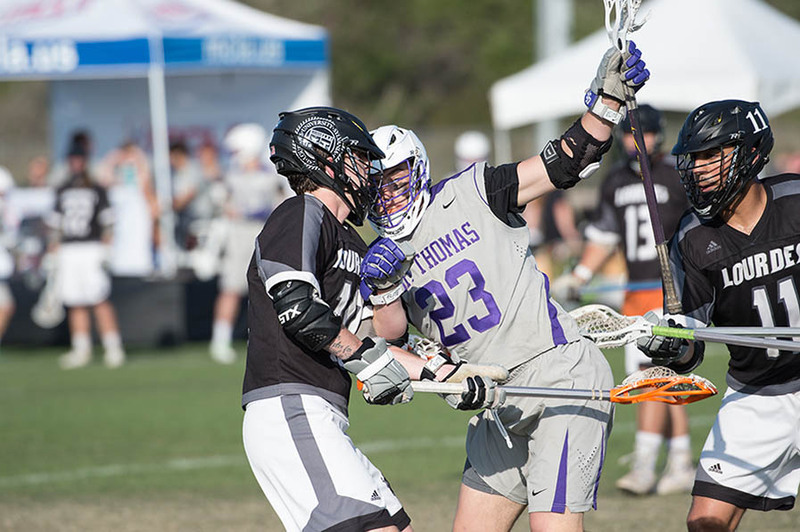 As has been their hallmark all season, St. Thomas used balanced scoring to build its lead, with senior middie Chris Moulton and senior middie Simon Gondeck leading the way with hat tricks. Senior Dan Bischel had seven goals for the Gray Wolves. Behind a stingy defense anchored by junior goalie Sean Pihl (12 saves), No. 2 Cal Poly (16-1) stifled No. 7 Colorado (11-6), 10-5 in the quarterfinals. The Mustangs advance to the semifinals where they play the winner of the Grand Canyon-Boston College contest. 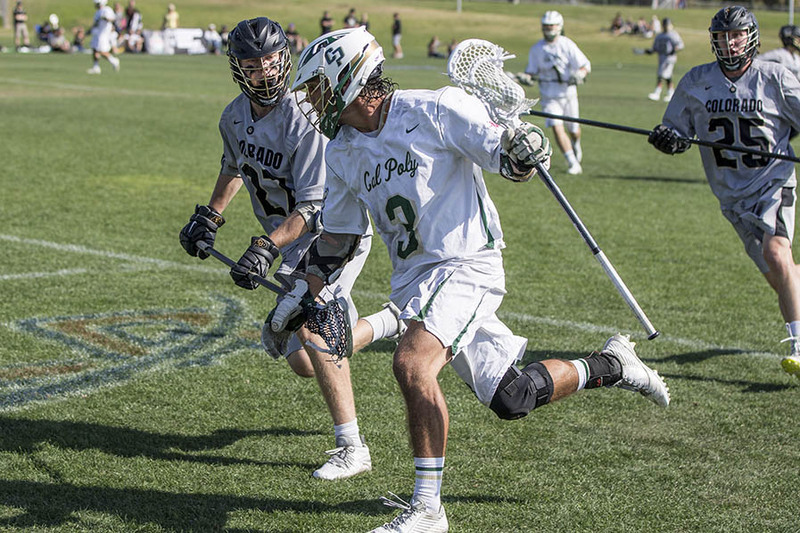 Cal Poly jumped out early, but Colorado found its legs during the course of the second quarter, cutting the gap to 5-3 at halftime. Any momentum the Buffaloes gained was quickly snuffed out by the Mustangs. They Mustangs outscored Colorado 3-0 in the third quarter to build an 8-3 lead that would not be threatened. Freshman A.J. Guralas potted four goals for the victors while sophomore attackman Andrew Laron had three goals and a dime. John Corbolotti also had two goals. Senior middie Hunter Molnar paced the Buffs with two goals and a helper while sophomore Jensen Makarov stopped seven shots. 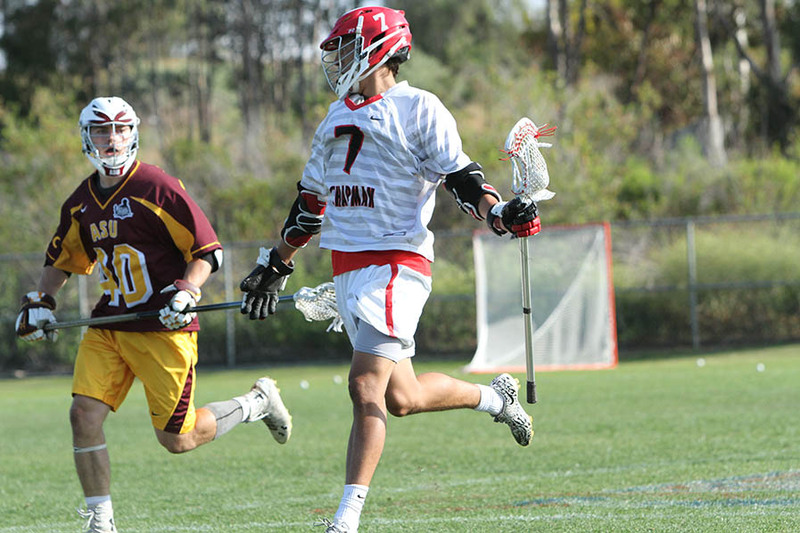 Sophomore attackman Dylan Garner scored five goals and dished out three assists, leading No. 1 Chapman (20-0) to a 16-8 romp over No. 9 Arizona State (8-7) in the quarterfinal round. The victory sends the Panthers to the semifinals at their own stadium on Thursday. Chapman tried to put the game away early, jumping out to a 3-0 lead, but the Sun Devils lingered. An uncharacteristically sloppy second quarter by Chapman allowed Arizona State to close the gap to 9-7. It was a brief interlude, however, as three consecutive goals by the Panthers pushed the lead back to five. Junior attackman Wesley Greason netted a hat trick in the winning effort while senior goalie Gus Gradinger made 12 saves for Chapman. “We thought we had some good matchups offensively and could force them to slide,” said Chapman coach Dallas Hartley. Junior middie Adam Beauchamp had three goals for Arizona State and freshman goalie Johnny Perlite had 12 saves.